Jakarta Governor, Anies Baswedan inaugurated Lapangan Banteng after its revitalization is completed.
" I appreciate all parties who are involved in this revitalization"
According to him, Lapangan Banteng revitalization has run well with a satisfactory result. 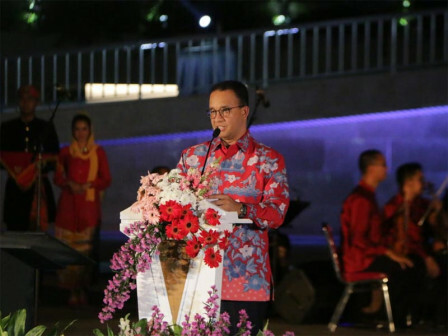 "Tonight, we are witnessing the return of the historic Lapangan Banteng after its revitalization," he stated at Lapangan Banteng, Sawah Besar, Central Jakarta, Wednesday (7/25) night. He mentioned, there is West Irian Liberation Monument in Lapangan Banteng. "Hopefully it can inspire us to in realizing equality and equal opportunity for all. I appreciate all parties who are involved in this revitalization," he expressed. For information, Lapangan Banteng revitalization was started on March 17, 2017 and divided into four stages. Those are fence installation, soccer field and sport facilities repair, monument area arrangement and amphitheater construction, and park arrangement. This revitalization was designed by Yori Antar. Through this revitalization, people now can watch colorful water fountain accompanied by Bagimu Negeri, Tanah Air, Indonesia Pusaka, Surilang, and Yamko Rambe Yamko songs. Water fountain is shown only on weekends for three times a day at 6.30 PM, 7.30 PM, and 8.30 PM with 15 minutes each.